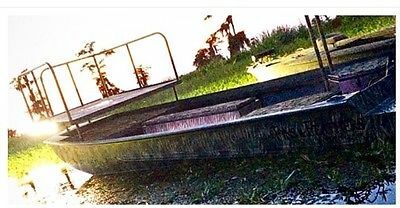 Up for sale is a 18ft Custom Fins & Feathers Hunting boat and trailer. Over $3,000 worth of just lights on the boat, interior lights, dual batteries, gas tank, cushioned seats, custom gun boxes, removable bow fishing deck with three 40" light bars, when removed, 22" light bar on front, outlet for spot lights, and more. Motor had only 14hrs on it. VERY LOW PRICE. Negotiable price. Message for any other questions or details. Motor not included. Located in central Arkansas, can work out pick up options.